Jim Pitzer of Colfax grills Invenergy representatives about Illinois Department of Natural Resources standards on wind tower placement Tuesday night. Invenergy is seeking a special use permit to put up about 100 turbine towers in northeastern McLean County near Gridley, Chenoa, and Lexington. Union members spoke Wednesday evening of the jobs the $300 million project would bring to local laborers. "A construction worker moves from job to job. But when a wind farm comes to town, that often means eight, nine months, perhaps a year or two of steady employment. And that's a great opportunity for someone to earn a decent wage, pay a mortgage, buy a truck and then that money returns to the local economy as it is spent," said Mike Matejka of Laborers Local 362. Barb Metz of rural Lexington, though, told board members she worries about the effect of the 100 turbines on her house. "I work at State Farm. I have been there 33 years. We are not guaranteed a job. And I know jobs are important to all these union boys here. I understand that, but my job isn't guaranteed either. State Farm is in an iffy spot right now. So the thought of my property value going down is very emotional to me, because I have no guarantees," said Metz. Matejka told zoning board members that in the last year Portillo's, Rivian, and Brandt have all come to the community asking for help to relocate. "Invenergy has not asked for any subsidy. They have not asked for any tax rebates. They want to spend $300 million in McLean County, said Matejka. The location of Invenergy's proposed wind farm. Each white dot represents a proposed wind turbine. Matejka asked the ZBA to consider the economic impact of that investment in its decision on a special use permit as well as the jobs the two years of construction will create. County officials have said during budget planning that much of the growth in the property tax base in rural areas in the last decade has come from wind farms. Amy Winterland of Colfax attacked expert testimony about $1.8 million in extra property tax money for Lexington schools caused by adding 100 wind towers costing $3 million each. Winterland noted the state will adjust aid payments based on the property tax base and the real benefit is only about $600,000 a year. Wind company representatives earlier presented studies in an effort to indicate any impacts to property values are only until the wind farm construction is complete and is likely a product of uncertainty. Julie Cotter of rural Lexington implied the wind company Invenergy cooked its study of real estate values with false comparables of specific houses that have sold in areas that have wind generation projects. "Downs is a booming community. Sibley is a sad little dying rural town. Nobody moves to Sibley. That is not even close to a comparison," said Metz. The Invenergy real estate study looked at wind farms in four states and found no long-term adverse impacts to home values from wind towers. Winterland said the arrangement of 10 proposed wind towers near her home keeps the projected average noise level just a half a decibel below the allowable standard. She also questioned the measurement because the sound created by new low-noise blades on some of the turbines has not been studied. Those are only estimates, she said. Winterland called for either moving some of the towers, making all of them low-noise technology, or requiring more of the ones close to her home with low noise blades. "The thought of my property value going down is very emotional to me, because I have no guarantees." Wind farm opponents also pointed out potential environmental impacts on everything from fish and mussels to other wildlife. Yael Young made an impassioned plea. "Every day my family wakes up and we see wood ducks, herons, great horned owls, and bald eagles outside our window. You keep saying the towers have no effect on aquatic life. What about the effect on the animals I just mentioned?" asked Young. Young was responding to testimony from Invenergy claiming there is no evidence wind turbine vibrations cause damage to stream life. The state recommends wind towers be 500 feet away from waterways to avoid damaging stream beds, though several in the plan are closer than that. People like Jim Pitzer of Colfax are also trying to use Department of Natural Resources standards to keep 450-foot wind towers away from their homes. Pitzer said one turbine is almost in his kitchen, "almost a sand wedge from" his house. Pitzer said the land he lives on has been in his family for more than a century and it is teeming with wildlife in the wetland, prairie grass, hilly pasture, and wooded areas. He said there are very few places in McLean County wildlife can go not only to shelter from the elements, but from man, and this is one. Invenergy says the 280 megawatt field of turbines would produce enough electricity to power 69,000 homes. Matejka, the union leader, said the nation is making a transition in a variety of areas, electricity among them. He said McLean County is well-positioned with wind power, and the electric vehicle industry to be part of the transition away from fossil fuels. The wind farm hearing will continue next Tuesday, the fifth night of hearings. That is nowhere near a record. It took 31 hearings to rule on the case of the White Oak wind farm near Carlock. Audio snapshot of Wednesday night’s ZBA hearing with the voices of ZBA Chair Jim Finnegan, Labor Leader Mike Matejka, Manuel Gonzalez of Bloomington, Andy Byars of Normal, Sarah Emberton, Julie Cotter of Lexington, Amy Winterland of Colfax, Barb Metz of Lexington, and Jim Pitzer of Colfax. 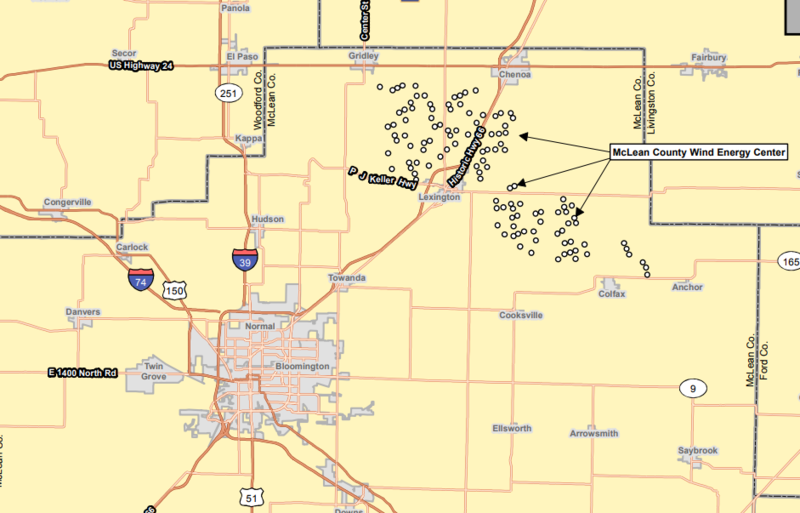 A wind farm company has filed an application for a new field of wind towers from south of Chenoa to Lexington and southeast nearly to Colfax. A top recycling request in Bloomington-Normal is to provide services at multifamily residences, such as apartment complexes.